Coach Garrett is a tall, lean running machine. He has consistently been running since high school and recently qualified for the craziest running club in the world called the Marathon Maniacs. Garrett has been part of our incredible coaching staff at Fleet Feet for a year and a half. His passion is to share his love and knowledge of fitness with our training groups. He has a Degree in Diagnostic Health and Fitness, and has been personal training since graduation from college. Garrett ran his first marathon at 19 years old. Although Garrett seems quiet, he is extremely observant and intuitive. He is quick to help runners through a rough patch, offering encouraging words, stories to distract a weary runner, or tips to improve form. Participants value Garrett’s knowledge and passion so much that he has quickly become a favorite to run with in practices. 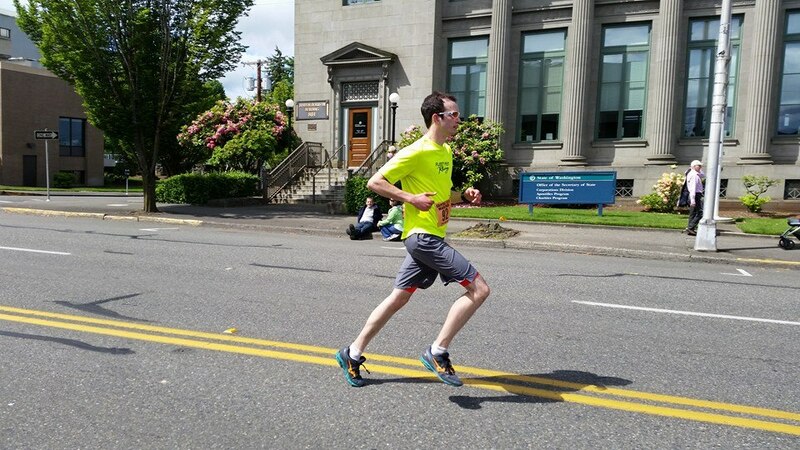 He drove down the morning of the Portland Marathon in 2013 just to cheer our Fleet Feet runners into the finish. This guy has heart. Garrett himself has completed a half marathon in 1:35 and 13 marathons, with a PR 3:32. Don’t let his speed intimidate you. Garrett knows how to train smart and peak for a race. Feel free to pick his brain for insight and valuable tips. His goal is to create a fun and non-competitive environment for Fleet Feet participants so that everyone can improve at their own pace. If he pulls up to run next to you, stay relaxed into your pace and be good with that. He is here to help you. His famous line??? “well, alright!” with a head nod. We love our Coach Garrett!